SAN ANTONIO (AP) Eric Bledsoe made life easier on Giannis Antetokounmpo on Friday night. It was a great first impression. 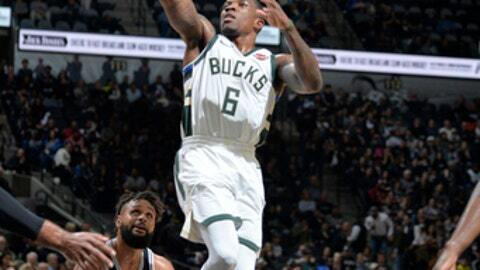 Antetokounmpo had 28 points and 12 rebounds, and Milwaukee snapped a four-game skid with a 94-87 victory over San Antonio in Bledsoe’s debut with the Bucks. Bledsoe had not practiced with Milwaukee aside from a morning shootaround, but he quickly adapted to the talent around him. He finished with 13 points on 6-for-15 shooting. Bledsoe got the start after he came over in a trade with Phoenix on Tuesday. The 6-foot-1 point guard had not played in nearly three weeks since being sent home by the Suns after posting on Twitter that he didn’t want to remain with the team following the firing of then-coach Earl Watson. Bledsoe made his first attempt, a runner from 13 feet. He also had seven assists. Led by Antetokounmpo and Bledsoe, Milwaukee won for the first time in November and snapped San Antonio’s three-game winning streak. Manu Ginobili’s hanging, left-handed bank shot led to a three-point play that got the Spurs within 89-87 with 2:26 remaining, but the Bucks extended their lead on jumpers by Bledsoe and Khris Middleton. Antetokounmpo and LaMarcus Aldridge played to an early stalemate in a battle of star forwards. Aldridge muscled his way to the basket and scored 20 points on 8-for-14 shooting, but had only two attempts in the fourth quarter. The Bucks’ length and quickness, especially Antetokounmpo’s, created havoc for the Spurs. San Antonio had 18 turnovers, two short of its season worst. Bucks: Middleton had 13 points. He averaged 26.3 points, 8.3 assists and 6.3 rebounds in his previous three games. … Despite having scored 20 points in three straight games, Malcolm Brogdon came off the bench for the first time this season after starting nine games. He finished with nine points and seven rebounds. … Mirza Teletovic missed his first game, sitting out after experiencing soreness in his left knee. Spurs: San Antonio continued to play without Kawhi Leonard (right quadriceps), Tony Parker (left quadriceps) and Joffrey Lauvergne (sprained right ankle). The three have missed a combined 33 games, with Parker and Leonard yet to play this season. … Aldridge has 16 blocks this season. Bucks: Host the Los Angeles Lakers on Saturday night in their third back-to-back of the season. Spurs: Host Chicago on Saturday night in the finale of a six-game homestand. Bledsoe has to adapt to a new team and system, but the Bucks have to get used to a different style of play, too. Count Popovich as among the multitude of admirers of Antetokounmpo, nicknamed the ”Greek Freak” for his ability to play like a guard with the length of a center.